Despite being more than 10 years old, the Mitsubishi Lance Evolution 8-9 continues to be a popular platform for modifications thanks to it's stiff chassis and tune-friendly 4G63 engine. With this in mind, Radium has developed a top-knotch fuel system solution for the vehicle. Making more horsepower requires more fuel to be sent to the engine. The Radium fuel pump hanger increases the pump flow capability while offering other advantages as well. 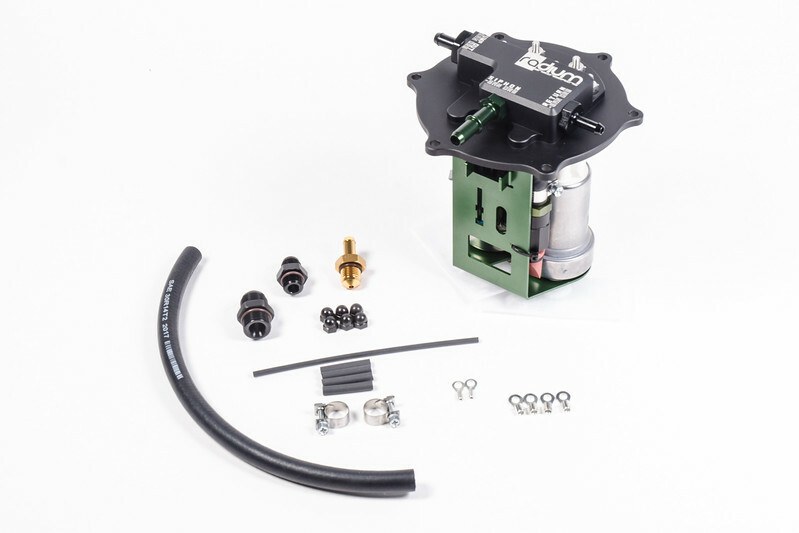 The hanger drops right into the OEM fuel tank and can be configured to use one or two Walbro F90000267/274 (aka Walbro 450 E85) high-flow pumps, able to supply up to 1,400HP worth of fuel. THIS HANGER IS ONLY COMPATIBLE WITH WALBRO 450 E85 PUMPS. As with other Radium in-tank hangers, this one includes a venturi jet pump that has been specially designed to operate with high flow pumps without causing high back pressure in the return line. The venturi jet pump uses the fuel returning from the regulator to create suction which draws fuel from the opposite site of the saddle fuel tank. Click Here to see a video of the jet pump working. The return fuel and the suction fuel is then deposited into the OEM collector box where the pump inlets are located. 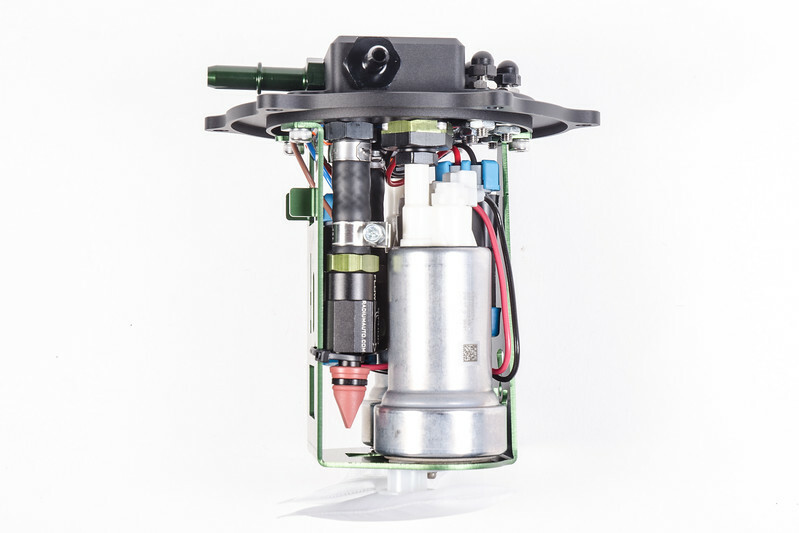 This system ensures there is always ample fuel around the fuel pump inlets. 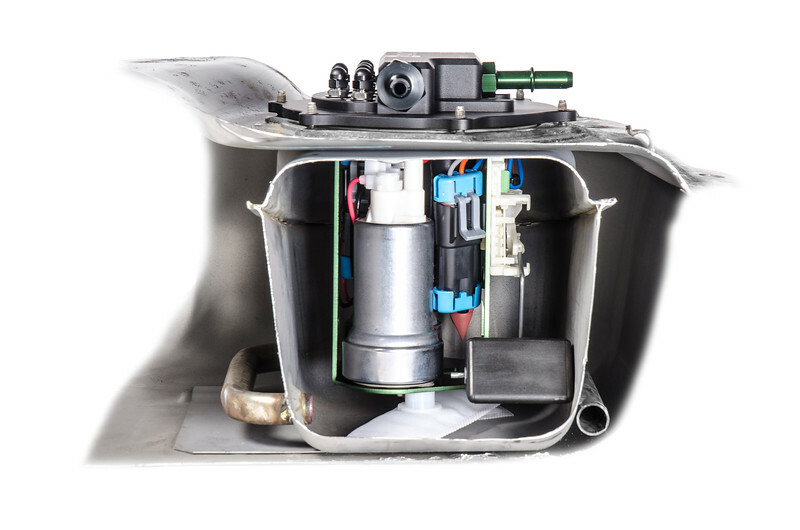 The Radium fuel pump hanger packages nicely inside the OEM in-tank collector box. The OEM collector box uses a wrap-around tube to allow fuel in, but keep it trapped during aggressive driving. The CNC machined aluminum top plate is designed to mimic the plumbing connections found on the OEM fuel pump hanger top plate. In most cases, this allows the OEM fuel lines and connections to be-reused. However, aftermarket high-flow -AN lines can also be used by swapping out the fitting adapters (included). Each electrical connection is clearly labeled for quick installation. Wiring terminals are included with the kit. The fuel hanger kit includes all the hardware, fittings and pieces shown above for a complete installation. It can be purchased pre-assembled with pumps, or without pumps included. As with all Radium Engineering products, this item is compatible with all fuel types including E85. A comprehensive plumbing kit can be purchased with the fuel pump hanger for a complete bolt-in kit . The plumbing kit uses large diameter pre-made PTFE hoses for a restriction-free feed line to supply fuel for high horsepower applications. The plumbing kit attaches directly to the Radium pump hanger feed port. 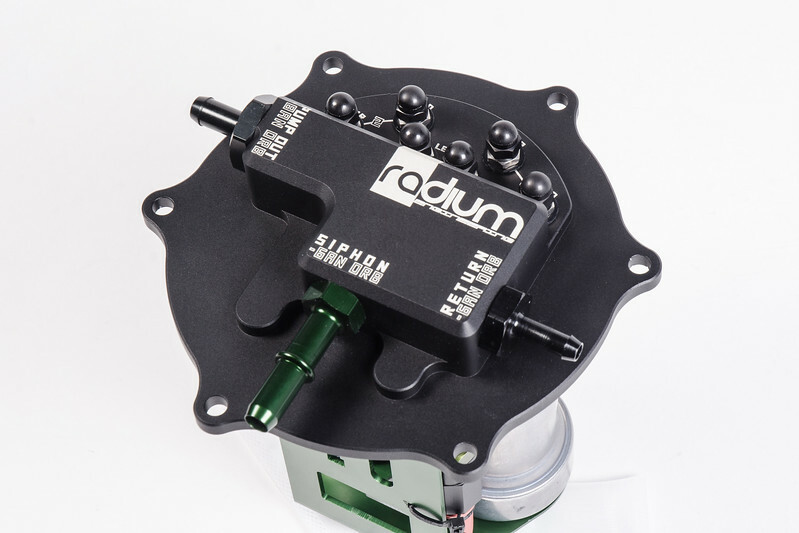 The plumbing kit includes a high-flow Radium fuel filter and specially designed mounting bracket for the Evo 8-9 chassis. The factory feed line is re-used as a return line for the regulator. All necessary fittings, hoses and hardware are included for a bolt-on installation. No cutting or drilling is necessary. Compatible with any fuel rail that can accept a -8AN hose. The plumbing kit can be seen at the bottom of THIS page. 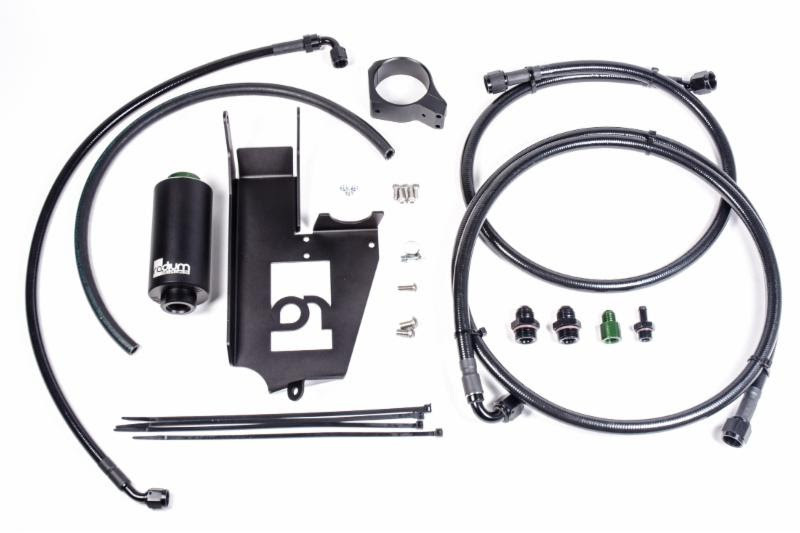 If building an Evo 8-9 fuel system from the ground up, the Radium Complete Fuel Delivery System is the solution. The system includes EVERYTHING needed, from the tank to the rail, all that is needed is injectors. 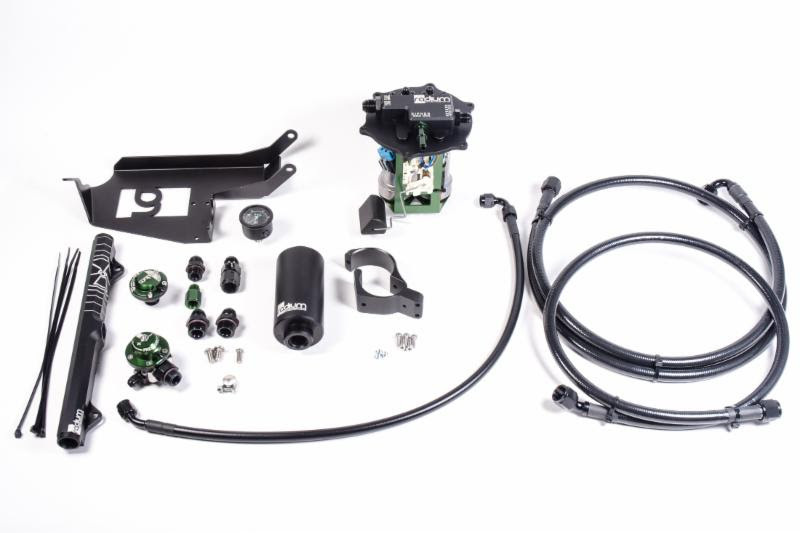 The system includes the Radium in-tank fuel pump hanger, plumbing kit, fuel rail, filter, pressure gauge, regulator, damper and all necessary fittings and hardware, just as shown in the photo above. More details on the Fuel Delivery System can be found HERE.